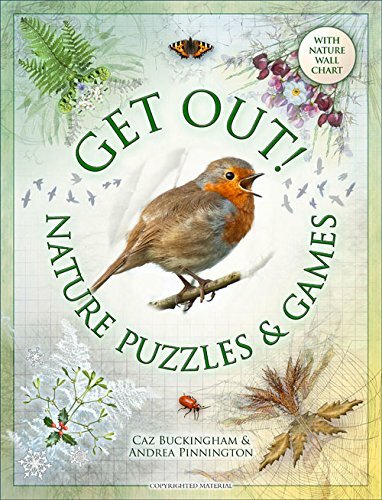 This highly original collection of nature-based activities will help to inspire a love of the outdoors from an early age, and is perfect for sunny days out and rainy days in. The book follows the progression of the seasons through the year, and features more than 30 imaginative activities suitable for younger children. These includes puzzles such as mazes, coloring and drawing, riddles, dot-to-dot, spot the difference, and memory games. The book also includes an illustrative fold-out nature wall chart tucked into a pocket in the inside back jacket, with plants and animals for children to find and check off. Caz Buckingham trained as an illustrator and graphic designer. She worked for more than 20 years for large corporate publishers before setting up Fine Feather Press with her business partner, Andrea Pinnington. Caz's distinctive designs and illustrations are a combination of artwork and photography that draw children into the world of plants and animals. Andrea Pinnington is the author of numerous children's activity books, including Animals, My Body, and The Princess Creativity Book. Caz and Andrea take all the photographs for their books. This provides the inspiration for their titles, which are designed to give parents the tools with which to engage their children with nature.